Senior day. Last game of the season. In Gainesville. Versus Kentucky. SEC standing and NCAA Tournament seeding are the stakes. The opportunity to sweep Kentucky in the season series. If these things aren’t enough to fire you up for Saturday’s contest, I don’t know what will. There’s a whole lot on the line as the Gators look to stay hot going into post-season play by beating Kentucky and with the Wildcats still angry about not getting a last second call when they played Florida at Rupp they’ll be fiery in their pursuit of revenge. 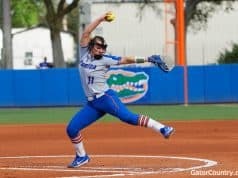 Let’s take a look at the storylines heading into a game many Gators fans will have had circled on their calendars since the schedule was announced. 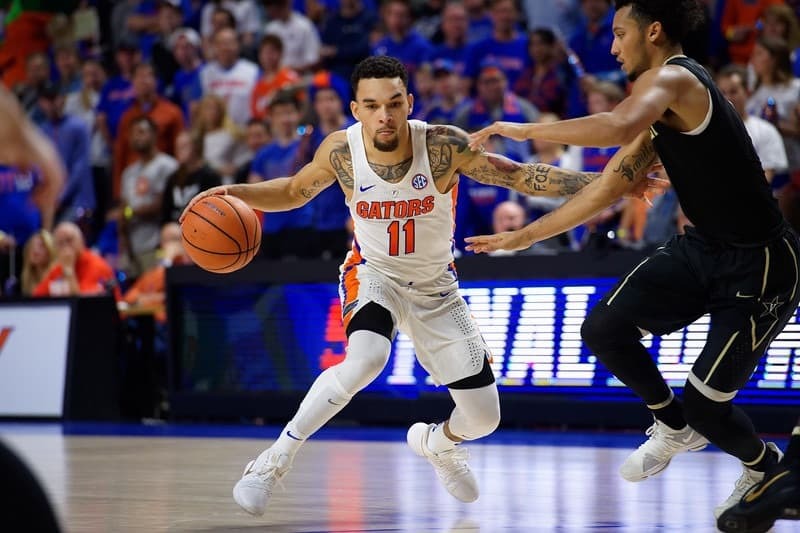 With his first helper of the game Chris Chiozza will set the record for all-time assists at the University of Florida passing Erving Walker for the title. He tied the record early in the second half against Alabama and was put back in the game with opportunities to get the golden assist but his teammate’s shots never fell. 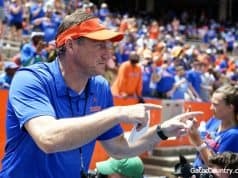 However, I think it’s somewhat poetic that instead of getting the record on the road at ‘Bama he’ll get it in Gainesville on the final night of the regular season in front of friends, family, and the Rowdy Reptiles. A pass-first player his entire career this a title he definitely deserves and will likely hold on to for quite a long time. One of the major storylines of this game is the fact the double-bye in the SEC Tournament is on the line (sort of). If Florida wins, they will finish 3rd in the SEC and get the double-bye. If Kentucky wins but Missouri beats Arkansas, Florida finishes 4th and still gets the double-bye. However, if Kentucky wins and Arkansas beats Missouri, the Gators finish 5th and don’t get the double-bye. 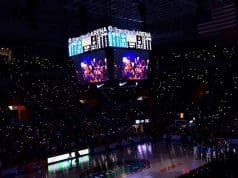 Rest is valuable at this point in the season and the Gators would love to have the opportunity to bypass the first two rounds of the tournament and let the tired legs of their starters recover and have their injured frontcourt heal. Now let’s take a look back at the previous meeting of these two teams where Florida edged out a 66-64 win and see what the Gators need to do to get another victory. Here were some major takeaways. Under much criticism this year, Kevarrius Hayes and Keith Stone actually had one of their better games of the season as Hayes finished with 9 points and 9 rebounds while Stone put in 14 points on 5-9 shooting. Both KeVaughn Allen (4-16 FG) and Jalen Hudson (4-13 FG) struggled from the wing to create offense against the size and athleticism of the Wildcats and any layups the big men can get from rim running in transition or creating an angle for a drop off pass will be big. Egor Koulechov had one of his toughest games of the season against Kentucky but you could say the deck was stacked against him as at 6’5” and 205 he was matched up with monsters like PJ Washington, Wenyen Gabriel, and Jarred Vanderbilt. He ended the game with 2 points on 0-8 shooting from the field, though he really competed on the glass grabbing 9 rebounds. With Dontay Bassett out with a concussion and the amount of minutes Gorjok Gak can provide questionable Koulechov will be forced to play the power forward spot for long stretches again and this will be a matchup Kentucky will try to exploit so we’ll see how the Gators can defend it. Gorjok Gak was out for game one of the season (alongside all the other injured big men John Egbunu, Chase Johnson, and Isaiah Stokes) and Bassett hadn’t earned Coach White’s trust quite yet and only gave 5 minutes so the Gators have beaten Kentucky without post depth before but they will be in tough to do it again. Have I already talked about Chris Chiozza in this article? Yes? Clearly that wasn’t enough. While multiple Gators struggled to produce in the lion’s den that is Rupp Arena, Chiozza brought his best basketball pouring in 13 points, 8 assists, and 6 rebounds. Faced with the difficult tasks of either taking on 6’6” Shai Gilgeous-Alexander one on one or staring down a wall of Wildcats when they went zone he moved the ball patiently and intelligently to find his team looks. He’s the leader and focal point for the Gators and the team will rely on him once again on Saturday. It’s no secret that Kentucky outsizes Florida at pretty much every position and one place that is usually going to manifest itself on the floor is in the rebounding category. Kentucky was +9 on the glass with 16 offensive rebounds, a number that the Gators can try to limit by finding bodies to box out but will still likely favor the Cats mightily. With the Wildcats getting tons of extra possessions by offensive rebounding the Gators matched by forcing a ton of turnovers, 17 in fact. Ball security is one area that Kentucky really struggles, as many young teams do, and the Gators need to try exploit that again by keeping plenty of pressure on the ball and playing in the passing lanes whenever possible. Ball security is something the veteran Gators backcourt does really well and even when faced with the extreme length of the Wildcats, Florida only turned the ball over seven times. In game one the Gators shot lower percentages from the field, from three, and from the free throw line but were able to win because they got more possessions due to the turnover margin and they’ll likely need to win that category again if they want to be victorious. Kentucky is a stout defensive team and it starts with their ability to contest 3-point shots or run shooters off the line entirely knowing they have a boatload of shot blocking behind them. The Wildcats are the second best 3-point percentage defensive team in the nation and that doesn’t even account for all the times they have bothered shooters enough that they neglected to even take the shot. Florida really struggled to find breathing room on the perimeter and ended up shooting 6-30 for 20% from the land beyond. Not only is that percentage bad but it was a ton of attempts, showing the Gators were reluctant to try and get the ball inside. Settling for contested jump shots is exactly what Kentucky wants and they’ll need to get some points at the hoop if they want to put some points up at the O’Dome on Saturday. Calipari has been reluctant to play zone defense in the past (usually citing his desire to prepare his players for the NBA) but they have been resorting to that tactic more than ever this year. The Gators have had a lot of trouble scoring inside this season and facing a zone would be even more difficult then getting interior buckets against a man defense so they’ll have to be prepared strategically to go at whatever Kentucky uses to try and stop them. Kevin Knox. He wasn’t excellent against the Gators in their first meeting (9 points on 4-10 shooting with 3 turnovers) but he has been the most explosive scorer for Coach Calipari and is going to create some big time matchup problems for the Gators with his length and athleticism. One thing the Gators lack on their roster is a big wing defender that can take the difficult matchups (think Devin Robinson last season, or even Justin Leon) so someone like Egor Koulechov or Jalen Hudson will have to step up to try to stop him, which could be difficult. Deaundrae Ballard has struggled to get minutes recently but if he can play provide a few minutes of quality defense it would be a massive help to the team’s success. There will be a few players on Kentucky that the Rowdy Reptiles will be giving it to pretty badly on Saturday, I’m sure. First, you’ve got Quade Green. He said in an interview earlier this week that the Wildcats needed to go into Gainesville and “spank” the Gators, and when given the chance to change his wording just smiled and redirected. He’s played better basketball of late but was 1-8 from the floor against the Gators and I’m sure he’ll get cheered on with every miss. The second player is Shai Gilgeous-Alexander, a player who committed early to the Gators when he was a relatively unknown 3-star recruit. As he slowly rose up the recruiting rankings, Coach White was seen as a genius for finding an under-the-radar recruit and getting in early. Then, one day, Gilgeous-Alexander de-committed from the Gators without explaining why. He committed to the Wildcats a few days later. This is a decision I’m sure the Rowdies won’t let him forget. Are you expecting fireworks when the Gators take on the Wildcats? Leave a comment here or post on the Gator Country forums. Previous articleDid the Florida Gators’ offensive line improve in 2017?